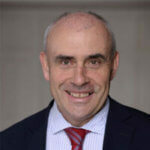 Professor Nicholson is the RCSI Professor of Paediatrics and Departmental Head. He is a consultant Paediatrician based in Children’s University Hospital, Temple Street and is Co-Dean of RCPI Basic Specialist Training in Paediatrics. Prof Nicholson is also the National Clinical Lead for Paediatrics for the National Clinical Programme. He is greatly involved in the impending publication of the New National Model of Care for Paediatric Health Care in Ireland. He is the former chairperson of the accident prevention group of the European Academy of Paediatrics and a member of the European Child Safety Alliance. He graduated from the UCD school of Medicine in 1981 with postgraduate training in Paediatrics in Dublin, Manchester, and Melbourne. Professor Nicholson is co-author of the textbook Diagnosing and Treating Common Problems in Paediatrics – the Essential Evidenced Based Study Guide. He has over 60 peer-reviewed publications, with an area of interest in injury prevention.